I actually agreed with a lot about this book and am going to go through all my possessions while asking myself the simple, but profound, question, Does this bring me joy? My possessions should not be a burden, and I don't want to be a slave to things I don't really care about. Reading this book gave me the freedom to bid a fond farewell to those items I've held onto out of guilt. Earlier this week, I took the first step in that direction, and I wanted to give a report back to all of you about how it went. Marie Kondo says that the first category you should tackle is clothes. She says that you should pull out every single item and lay it on the bed or the floor so you can go through it one piece at a time. And so I pulled everything out of the closet, out of my drawers, off of hooks, and I even brought up a bin of seasonal clothing from the basement storage room. And then I did just as Kondo suggested: I held each item in my hands and seriously asked myself, Does this bring me joy? Just asking that question gave me the freedom to let go of some things I've been hanging onto for a long time (since before I went to college 12 years ago) solely out of guilt. I've done many other clothing purges before, but I've never taken everything out at once, and I've never made it a priority to consider each item one at a time. Let me tell you--it was definitely freeing to be able to say good-bye to some things that made me irritated every time I had to pass over them to get to the clothes that I really wanted to wear. In the book, Kondo acts like it's okay if you whittle down your closet to basically nothing because it will force you to replace things with items you love. However, I felt like that was being rather materialistic and a luxury that I just don't have right now. As much as I would like to replace my entire wardrobe, it's not in the budget, and I have to wear something--preferably more than a rotating two outfits. It felt a little presumptuous and stuck up to me to say, "Nope, that doesn't bring me joy" and throw out a shirt I just wore yesterday. And so, in the end, I kept some things that didn't bring me joy because they're practical, functional, and most importantly, I actually do wear them. And I will keep wearing them until I can replace them (slowly but surely) with clothing I do love. But even disobeying the rule, I still got rid of two full garbage bags, and it felt so good. And then came the fun part--putting it all back in my drawers using Kondo's folding method. "The goal is to fold each piece of clothing into a simple, smooth rectangle. First, fold each lengthwise side of the garment toward the center (such as the left-hand, then right-hand, sides of a shirt) and tuck the sleeves into to make a long rectangular shape. It doesn't matter how you fold the sleeves. Next, pick up one short end of the rectangle and fold it toward the other short end. Then fold again, in the same manner, in halves or in thirds. 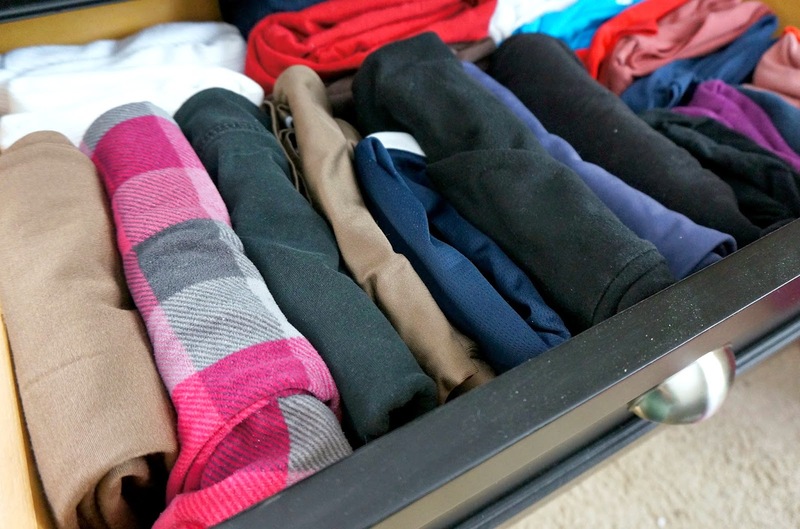 The number of folds should be adjusted so that the folded clothing when standing on edge fits the height of the drawer." You have to have just the right number of things per drawer so that they all stay standing up without being so tight you can't put things in or take them out or so loose that they just fall over (and this seems like a rather difficult balance to maintain with the constant clean-dirty-clean cycle of laundry). I don't know what to do with jeans. In order to get them short enough so that they'll clear the drawer when I close it, I have to fold them over so many time that they're really thick and bulky. 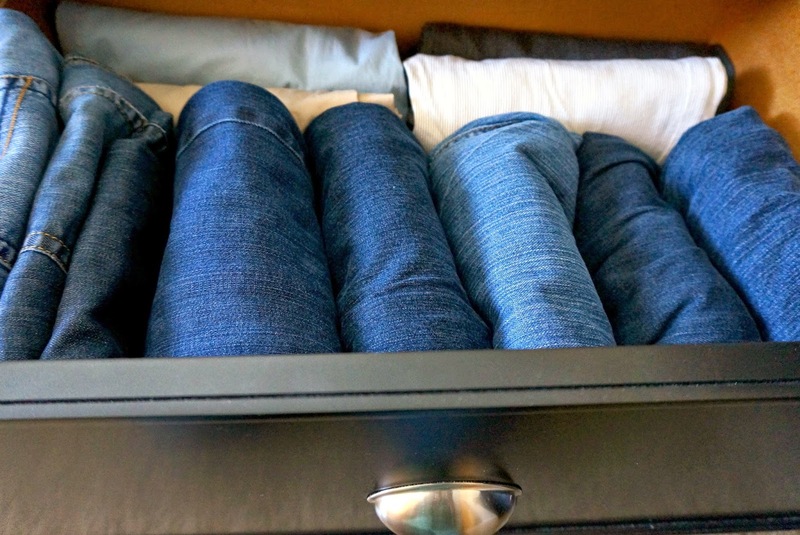 I will say that I tried a similar method to this one several years ago (where you rolled all of your clothes into logs and then stood them up in the drawer), but I like Kondo's method infinitely better. Between purging and folding, I've cut down significantly on the frustration and irritation I feel when I'm getting dressed in the morning. So, life-changing? Maybe. But life-improving? Definitely. I would welcome any thoughts/opinions you have on finding balance between joy/practicality/frugality and also your best tips on how to fold clothes. Ha! 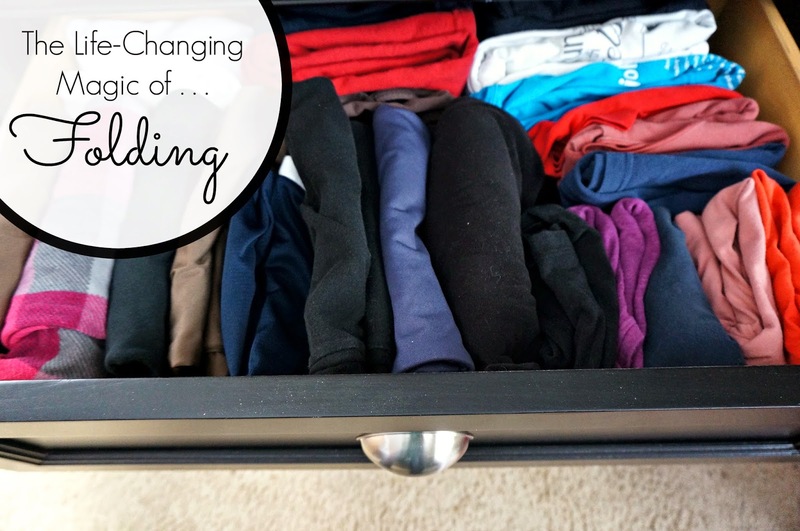 You beat me to this post (I still have one planned on my own folding experience). And when it comes to the balance between joy/utility/practically, one of the ways I got around it was by saying "It brings me joy to have a type of clothing that fulfills x function. So even if this individual piece of clothing doesn't fill me with joy, I would be unhappy if I didn't have any of this type of clothing in my closet." So, maybe cheating a little, but like you, I don't have money (or time) to replace everything right now with what would actually bring me joy. But this concept will definitely influence my purchase choices going forward. 2. Her method of removing every piece of clothing and going through pieces one by one is what I used last spring when culling books. It worked wonders. It separates books from where you're used to seeing them (with others of the same genre, for instance) and really makes you look at the book instead of the shelf or genre or topic. I was able to break the hold that wall of books had on me and I get rid of oodles of books. Speaking of, I'd love to see a post (or several) sometime about which books you keep in your collection. That would be a blast! I saw that this was on your reading list this month. I can't wait to hear your thoughts on it! Also, funny you should mention books because when we moved last year, I set aside a room in our house to be our library, and I'm almost ready to reveal it, books and all. So stay tuned! I tend to fall into the same category as you. I may not love every piece of clothing in my closet, but there are some that I wear regularly just because their staple items that I can cycle into my wardrobe. I don't feel that I have the luxury of replacing all of them with beloved pieces. And that's okay as long as I don't buy pieces I don't wear. Exactly! I've been trying harder lately to not buy things just because they're on sale and also to be willing to splurge on items I really love even if they're a little pricier. Sorry your original comment was lost! That's always so frustrating (especially when writing it out on a phone! ).